its origins in the 15th, but mainly 17th-century. 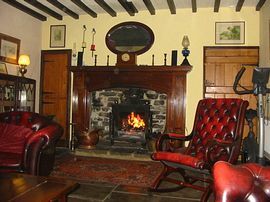 Like the log-coal burner in the dining room, the cosy open fire-stove in the lounge, the flagged floors, beamed ceilings, shutters and many items of period furniture, to create a comfortable and relaxing environment. 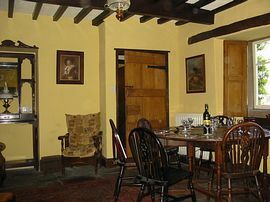 The Old Hall is owned by Keith, an experienced ex-hotelier, who appreciates what you the visitor wants and goes to great lengths to provide it. 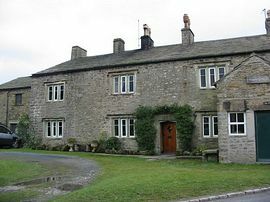 He is pleased to offer accommodation at The Old Hall for your enjoyment. windows may not fit like pvc double glazing. So if you are looking for suburban living standards I am pleased to say that is not The Old Hall. 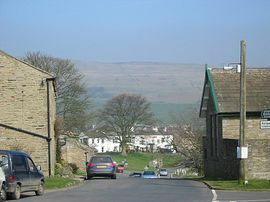 Dales Bus from Northallerton via Bedale and Leyburn. 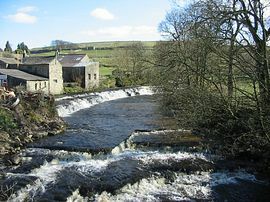 Western route- M6 to J35 for Sedburgh then Hawes to Bainbridge. Friday and Saturday, Public and school holiday periods. £35 pppn based on two sharing. £15 per night single occupancy supplement. Off Peak from £25 pppn based on two sharing. Please see our website for details of offers available.